Brian Vike of HBCC UFO Research in Terrace, British Columbia has been receiving numerous reports of possible Sasquatch activity in recent months. The following was reported by The Province on Thursday,September 25, 2008. "Tales of a giant, hairy ape-like creature trampling through the woods are running wild in a northern Interior town after a rash of Sasquatch sightings. "To be honest with you, I don't know what to make of all this," said Vike. 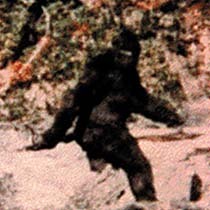 "I know with UFOs we're doing well in B.C., but I don't know with the Sasquatch. I'm just trying to figure it out." The other sightings were on Morgan Road in Houston in July and on Telkwa Highway Road in Moricetown, about an hour and a half away, on Aug. 27. We cannot help not to notice the increase of Bigfoot activity that is occurring along with an increase in UFO activity in that region of Canada, and can only speculate if they may or may not be somehow related?